Vancouver BC – For 14 years, Vancouver resident Craig Elliott, who is living with primary progressive multiple sclerosis (PPMS), and his family have been waiting for a therapeutic advancement for the treatment of progressive MS and recently they experienced just that. 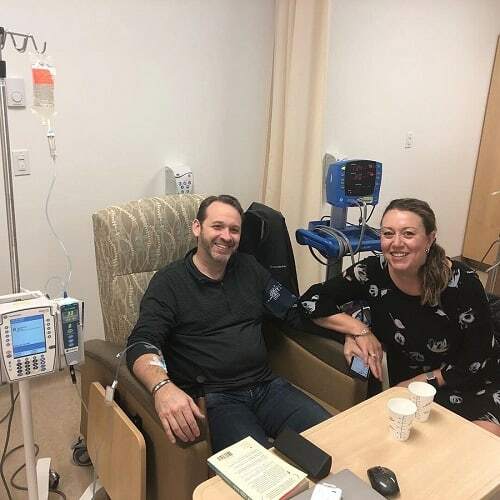 Craig, who is a Partner in an accounting firm and a father of two, ages 17 and 15, received his first infusion of ocrelizumab (Ocrevus) – the first drug on the market conditionally approved by Health Canada for treatment of early PPMS, a form of the disease characterized by a steady worsening of neurological function. Ocrevus is said to act as an immunomodulatory drug that targets and removes potentially harmful cells in people living with MS.
His wife Cindy, who is a practice consultant with Providence Health Care, said she and Craig could not be more excited about this new development that is happening just before the fourth annual Women Against MS luncheon taking place on November 22 in Vancouver where they will be in attendance. Having only been conditionally approved this year, the treatment is considered new but that doesn’t change the optimism the Elliotts feel, they say. •	Primary-progressive MS is characterized by a slow accumulation of disability, without defined relapses. Approximately 15 percent of people diagnosed with MS have primary-progressive MS. About five percent of people diagnosed with PPMS experience occasional relapses with steadily worsening disease from the beginning. •	On February 14, 2018 ocrelizumab (Ocrevus) was approved, with conditions, by Health Canada as monotherapy for the management of adult patients with early primary progressive multiple sclerosis (PPMS) as defined by disease duration and level of disability. This is in conjunction with imaging features characteristic of inflammatory activity. Health Canada previously approved ocrelizumab for the treatment of relapsing-remitting MS (RRMS) in August 2017. •	For more information on how Ocrevus works, visit the MS Society’s disease-modifying therapies page and check out the ocrelizumab FAQ.